Suture Line Leaks After Laparoscopic Sleeve Gastrectomy : Difficulties of Management Might Be Underestimated. Back ground- Laparoscopic Sleeve Gastrectomy (LSG) is suggested as a safe alternative in high risk, high BMI patients, it might be associated with higher leak rate when performed as definitive procedure over smaller bougies. Use of staple line reinforcement has been advocated to reduce risk of hemorrhage and decrease leak rate. There were reports of considerably higher leak rate in male patients with thicker stomach. There is paucity of data on management of gastric leaks. Methods- Fifty LSG were performed between January 2008 to July 2009. There were three early gastric leak and one late leak (6months).There were no leaks in 35 females and all 4 four leaks happened in male patients (4 of 15 males 26.7%). Baseline BMI was 50.95 (49.5-51.3). LSG was performed using Endo-GIA 60-3.5 and 60-4.8 with staple line reinforcement with Peristrips. All the patients had intraoperative endoscopy and UGI series on post operative day one. Results – First patient showed air leak intraoperatively near the gastro esophageal junction due to incomplete closure of staples. Suture line was over sown with non absorbable suture. Postoperatively, leak persisted on swallow study resulting in reoperation and attempted suture repair. Sepsis was adequately controlled with drain. 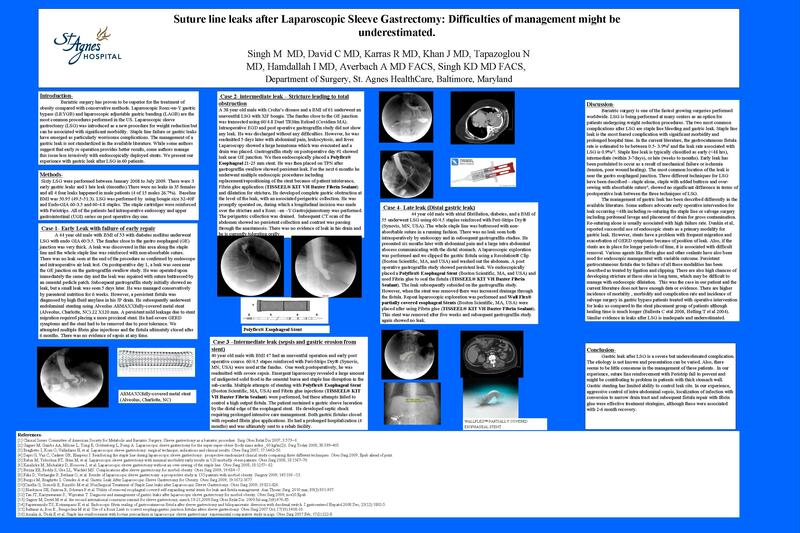 Patient could not tolerate gastric stent and required multiple attempts of endoscopic fibrin application that resulted in fistula closure at 6 months. Second patient had a normal intra operative endoscopy leak test followed by normal UGI series. He was readmitted within a week for abdominal pain and anemia. Gastrograffin UGI series demonstrated leak and subdiaphragmatic fluid collection that was drained laparoscopically and reinforcement of the suspected leak site. Subsequent multiple stenting and fibrin glue applications resulted in fistula closure within 2 months . Third patient had an uneventful operation and early post operative period. He was readmitted in one week with severe sepsis. Emergent laparoscopy revealed large amount of undigested solid food in omental bursa and staple line disruption in subcardia. Multiple attempts of stenting failed to control high output fistula. Patient sustained gastric sleeve laceration by distal edge of the stent. Eventually both gastric fistulas closed with repeated fibrin glue applications. The fourth patient had an uneventful procedure and postoperative course for 6 months. He was readmitted after 6 months with abdominal wall and intrabdominal infiltrate . Repeated laparoscopic interventions, gastric stenting and fibrin glue application were required to control localized sepsis and achieve fistula closure over the course of 2 months. There was no mortality. Conclusions- Gastric suture line leaks after LSG might present formidable treatment challenge. Male super obese patients appear to be a risk group for this complication. Suture line reinforcement with Peristrip fail to prevent and might be contributing to problem in patients with thick stomach wall. Gastric stents have limited ability to control leak site. Aggressive control of intra abdominal sepsis, localization of infection with conversion to narrow drain tract and subsequent fistula repair with fibrin glue appeared in our experience as an effective treatment strategy though associated with 2-6 month recovery.